Stormtroopers line up on the field during halftime of an NFL football game between the Chicago Bears and the Minnesota Vikings, Monday, Oct. 9, 2017, in Chicago. The trailer for "Star Wars: The Last Jedi" debuted in dramatic fashion during Monday Night Football halftime. 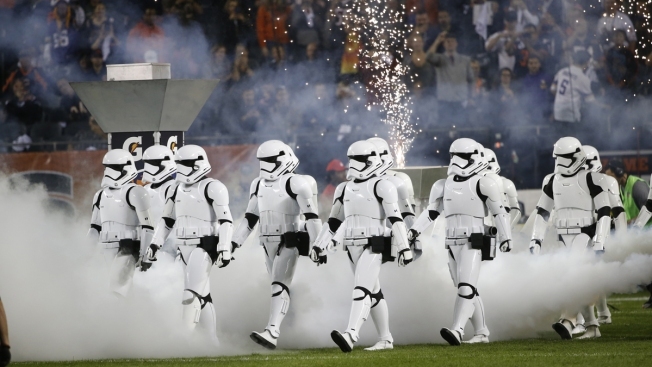 Fireworks flashed and Stormtroopers marched onto Chicago's Soldier Field as the preview played onscreen. It featured new and familiar characters from the Star Wars universe. The clip opens with voiceover from Adam Driver's Kylo Ren saying, "When I found you, I saw raw, untamed power — and beyond that, something truly special." Then Rey (Daisy Ridley) is shown wielding her light saber and questioning her destiny as Luke Skywalker (Mark Hamill) observes, "I've seen this raw strength only once before. It didn't scare me enough then. It does now." The trailer received plenty of interest on YouTube, where it was the No. 1 video on the trending chart with more than 7.5 million views by Tuesday morning. "The Last Jedi" is the latest installment in the Star Wars franchise since the Disney reboot that began with 2015's "The Force Awakens." It's set to hit theaters Dec. 15.